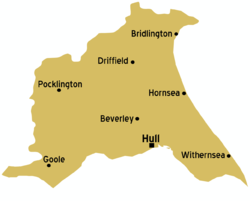 East Yorkshire is generally regarded as a county in Yorkshire in England, part of the United Kingdom. It is actually a unitary authority for all local government functions. The city of Hull, which dominates the East Yorkshire economy, tourism and infrastructure, is a separate unitary authority. The easiest way to get to Beverley is to take the train or the bus from Hull, or the bus from York. By plane: The nearest airport is Humberside Airport. There are bus, rail and taxi services from the airport. Trains run to Doncaster (change for Hull) and busses run to Hull. By Rail: Trains run regulary from Hull to Beverley. By bus: There is a good bus service operated by the the East Riding of Yorkshire Council (ERYC). Busses run from Hull and York, as well as other smaller local towns. Make sure you take the time to visit Hull, the main city. This page was last edited on 30 September 2012, at 21:00.